I wanted to document all of December because there were moments after Christmas that I wanted to share. Also I felt the album would be incomplete if I didn't document all the way to the 31st. Here are the last few pages for Week Five! I just included a picture of Bear in the store with his basket of goods! I printed it regular size and cut it down to 4 separate little photos to insert into the 2x2 pocket page. Former coworker was up visting her family in Virginia. We all decided to meet up for lunch at Jackson's for Day 29. (Yup, that's right, went twice in two weeks, no shame! And you know we got the Salmon Salad!) I printed a group picture then added one of the filler cards and added a tag (Free printable here!). At the bottom, I added a filler card from the Midnight Edition Kit. It was orginially a full card that I cut in half to fit into the 2x2 pocket. Day 30, didn't have much going on but wanted to share that I was going to start Project Life in the new year. I included a picture of the filler cards from the Midnight Edition Kit. Beautiful isn't it?! At the top pocket, I added this free printable (found here) wrapping paper and added a date stamp. For New Year's Eve, it was my brother's birthday, we didn't celebrate till the new year. I had a New Year's Day run the next day so kept it lowkey for NYE. Made a last minute new year's eve hat for Bear. :D Yup, went with another free printable (here). Thought the stars would go well with the photos. Thought a good place to keep all the Christmas card we received this year all in one place would be with the album. Inserted a plain sketchbook paper and added Martha Stewart ribbon paper and sticker. Wrote, "See you next year December!" And that completes December Daily 2014. It has been a wonderful first experience working on this album and look forward to doing it again next year! Week one of December Daily done. Now for Week two! I have to admit, keeping up with the daily photos and journaling is a lot more difficult than I thought. You can definitely fall behind fairly quickly. To continue with Day 6 Party photos, on the top pocket, inserted some wrapping paper. Then added a red Martha Stewart Craft Label. On the bottom pocket, added a 4x6 photo of the buffet table from the holiday party. Went with a four pocket view for Day 7's layout. For the upper left corner, used some leftover kraft polka dot wrapping paper from Target. Inserted a simple date/month on cardstock created in Word. At the bottom, printed out a 4x6 photo from "Run with Santa 5k" and cut it in half and inserted it into the remaining pockets. Mixed up the type of photos by adding a polaroid for day 8. On the upper left corner, took a picture of our mini christmas tree and added some embellishment with a gold safety pin. Added a pine tree left to the back of the kraft polka dot paper. Bottom left, inserted the same wrapping paper in red. Lastly, I took a picture of the wreath I have up on the door and added a glitter number 8 top. Day 9, Hot Chocolate Bar day! Added a 4x6 photo from that day. Then in the bottom pocket, wrote a little about the hot chocolate bar (second year doing it!). Back to a two pocket view for Day 10 and 11. Continuing with trying to keep some white space and clean lines. For Day 10, on the top pocket, kept with the simple date/month and wrote a little bit about addressing cards for the first time. Then added a photo of addressing cards with a side of oraments and coffee! Used a mailing label and date stamp and added to the envelope and secured it with a red/white paper clip. For Day 12, found these kraft bags earlier in the year at Target (Dollar section) and added some stocking prints. These are from cards I had from a while back (also Target) and just took them off the card and adhered it the kraft bag. Inside the kraft bag, I printed out Bear's wishlist on a smaller scale and punched a hole and added some ribbon. Back of the kraft bag, added a simple date/month for Day 12. Ended the week with a day in dog sitting Bear's brother, Miso! Wild night, I tell ya! ;] Printed a 4x6 photo and cut it in half for the upper pockets. For the lower left pocket, found this wonderful free christmas tree printable. 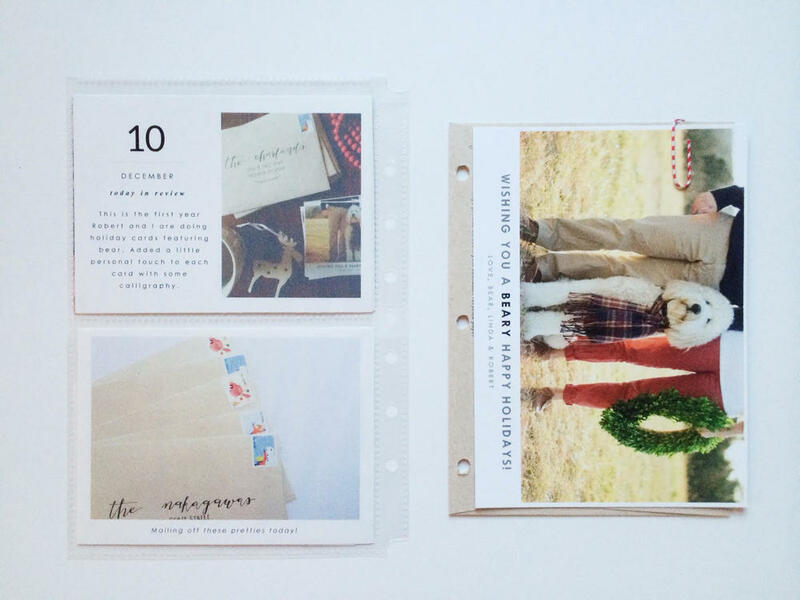 For the last pocket, cut out simple cardstock and adhered a mailing label with a date stamp. Slowly getting back into the routine after a wonderful mini trip. Holidays are in full swing, between addressing holiday cards and prepping for annual holiday party, hope to stay updated on December Daily album. Working on this album really brings me back to the old scrapbooking days. This was really my first love, working with paper goods and photos. Above is the title page, here I found a reindeer template and scaled it down (really really little) and traced it on to some scrapbooking paper I previously had. I adhered it to a 5.5 x 8.5 page where I typed out 2014 - Eat, Drink and be Merry! I wanted to do a full spread for the first day of December. On the left side, I printed out a full picture of the trees from the mini trip to Savage River Lodge. On the right side, I printed out the Savage River Lodge sign and for the bottom, I split and put a photo then on the other side, I put "1" and wrote a little bit about the trip. I then inserted into Martha Stewart sheet protector with two pockets. For Day Four, I left the number 3 sticker in the clear pocket and no backing. To the left, I took a picture of when I was at target in the holiday section aisle. I created a "polaroid" as a frame for the picture. Below the picture, I included a receipt and used a festive white and red stripped paper clip and put it on top of a Trader Joe's bag. I found some free polka dot printable and added a white textbox over it with a date stamp. Day Five, on pinterest, there was this great "Making a List" printable. It was a great way to organize for gift giving. I added a little blurb under the picture. I went with a full spread for Day Six. On the left side, created a 3x3 collage and inserted some of the photobooth pictures from the holiday party. I filled the non-picture boxes with a wooden reindeer (Found at Paper Source) For the gold stars on the upper right corner, punched some stars out of some gold paper that I previously owned. On the right side, in the top pocket, I inserted the holiday invitation. On the bottom, I took a picture of part of the backdrop and wrote a little bit about the party. Last week, I shared a little bit about December Daily Album. Today I am sharing how I am prepping to fill the album. What makes this project challenging is to capture more daily moments during the busiest month of the year.